By Scott Gilfoid: Former WBA heavyweight champion David Haye (26-2, 24 KO’s) has decided to take a soft opponent after all for his next fight. Haye, 32, is reportedly facing #8 WBC, Manuel Charr 23-1, 13 KO’s) for his next fight on June 29th at the Manchester Arena in Manchester, UK. Charr may be ranked by the World Boxing Council in the top 10, but that’s the only sanctioning body that has him ranked in the top 15, and he’s clearly a 2nd tier/3rd tier fighter. I see him as just a tad bit above 3rd tier in terms of talent, and I’m so not surprised that Haye is fighting him. 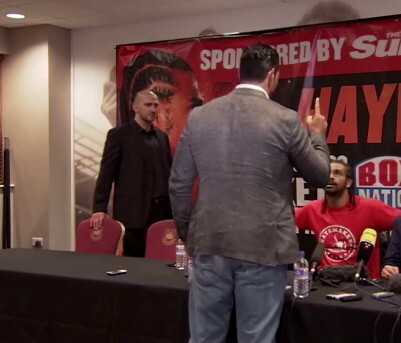 This is a classic, record-padding fight for Haye and so, so typical of him. Deontay Wilder takes heat for fighting less than talented guys, but he’s 32 friggin years old either and he only had a little over 30 amateur fights before turning pro. He’s not like Haye, who had a long amateur career and is being spoon fed at the pro level. Haye, #1 WBA, #4 IBF, #5 WBO, #6 WBC, is looking to get locked in as the mandatory challenger for IBF/IBO/WBA/WBO heavyweight champion Wladimir Klitschko, so he needs at least two wins over top contenders for him to get to that. Haye’s trainer/manager Adam Booth was talking about Haye fighting an unbeaten, talented top 10 contender for his next fight. When I heard that, I’m thinking Haye is going to fight Wilder or maybe Kubrat Pulev, but in the back of my mind, I knew it was going to be another soft opponent like the guys that Haye fought to get a title shot at former WBA heavyweight champion Nikolay Valuev in 2009, and sure enough, I was right. Haye is fighting the 28-year-old Charr. What a pity. Charr is one of those Francesco Pianeta type heavyweights with a built up resume filled with nothing but fluff opponents. He’s painfully slow, easy to hit, and not particularly skilled at all. His fighting style is that of a brawler, but not a skilled one. I mean, Charr wouldn’t last a round against Deontay Wilder. I could see him getting poleaxed with the first right hand from Wilder because he’s so damn easy to hit. Charr’s claim to fame was getting stopped in the 4th round by WBC heavyweight champion Vitali Klitschko last year in September. That was the fight where Vitali tore Charr’s face to ribbons in brutally one-sided fight, and then afterwards, Charr marched around the ring, bitterly complaining about the fight being halted, as if he was going to do anything other than soak up punishment. The ringside doctor did the right thing because if he let the fight continue, Charr would have bled all over the place and it would have been a sickening sight for the boxing fans to see in Moscow, Russia.